Lok Sabha Election 2019: BJP chief Amit Shah will address a rally in Gujarat's Gir Somnath, before doing a road show and rally in Banaskantha. Congress President Rahul Gandhi will address rallies in three states today, with election season in full swing. Rahul Gandhi will first address a rally in Agra, where he will be joined by Priyanka Gandhi and Jyotiraditya Scindia. He will then address a rally in Gujarat's Bhavnagar before speaking at another rally in Maharashtra's Nanded. BJP chief Amit Shah will address a rally in Gujarat's Gir Somnath, before doing a road show and rally in Banaskantha. The Supreme Court is expected to hear the plea of the producers of the biopic on Prime Minister Narendra Modi to lift the Election Commission's ban on the movie until the end of the elections. 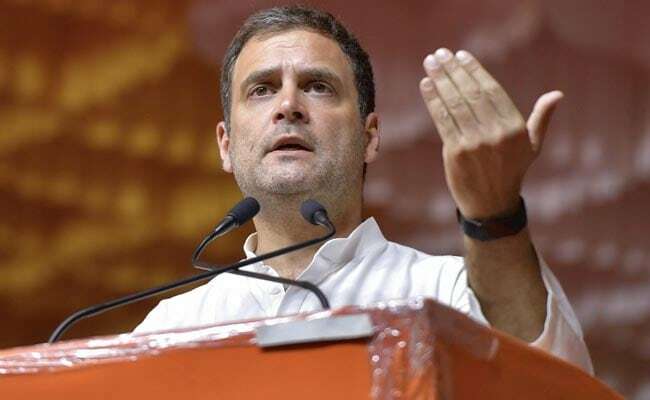 Rahul Gandhi, speaking for the first time on the hard-nosed negotiations with the Aam Aadmi Party (AAP) on an alliance in Delhi for the national election, tweeted today that the party was ready to give up its claim on four of seven seats but Arvind Kejriwal had done a U-turn. "Our doors are still open, but the clock is running out," the Congress president posted. "What U-turn? Your tweet shows your interest in alliance is just pretence," Arvind Kejriwal retorted, accusing Rahul Gandhi, once again, of helping Prime Minister Narendra Modi. "Akhilesh Yadav is not accepting Azam Khan's mistake, but he is saying the language will not be changed. If such people come to power in Rampur, women would have a hard time even stepping out of their homes. Sisters, the time has come to show women's power": Jaya Prada. Uttar Pradesh Chief Minister Yogi Adityanath has been barred from campaigning for the next three days for his communal comments, criticised by the opposition as a blatant violation of the Model Code. Train tickets with photographs of Prime Minister Narendra Modi are still being sold in Uttar Pradesh in the middle of the Lok Sabha elections, even after the Indian Railways said it would withdraw them following allegations of poll code violation..
"Should I die? Then will you be satisfied," BJP leader Jaya Prada said, hitting back at Azam Khan. "You think I'll get scared and leave Rampur? But I won't leave," she said. "He shouldn't be allowed to contest elections. Because if this man wins, what will happen to democracy? There'll be no place for women in society," she said. An FIR has been filed against Samajwadi Party leader Azam Khan for his comments made allegedly against his BJP rival Jaya Prada. The SP leader had said on Sunday, "...I want to ask you, should politics stoop so low? 10 years the person sucked the blood of Rampur , I held that person's finger and brought the person to Rampur. I made her familiar with the streets of Rampur . I didn't let anyone touch her. No dirty words were used. You made the person your representative for 10 years . But what is the difference between you and me. Rampur waalon, Hindustan waalon , uski asliyat samajhne main aapko 17 baras lag gaye (understanding the person's real face you took 17 years). I realised in 17 days, that the underwear beneath is of the khakhi colour."